Manufactured on equipment which processes products containing milk, eggs, soybeans, wheat, shellfish, fish oil, tree nuts and peanut flavor. Mix 1-2 scoops of King Beef™ with 6-8 ounces of water (per scoop). Use 2-4 servings of King Beef™ daily to help achieve your daily protein needs. take King Beef™ throughout the day and both before and after your workout to maintain an anabolic state while keeping your caloric intake low. Steak & Potatoes Blend (BeefISO™ (Beef Protein Isolate), & Sweet Potato Powder), Maltodextrin, Cocoa Powder, Natural & Artificial Flavors, Salt, Sucralose, Acesulfame Potassium, & Powdered Silicone (Antifoaming Agent). Take 1 scoop with 6-8 oz. of cold water. Vary the amount of your chosen liquid to acquire desired flavor and consistency. To further increase protein intake and to create a milkshake-like consistency, try adding fat-free or low-fat milk in place of water. Foaming will occur in shaker, allow 5-10 minutes for foam to dissipate. Use in conjunction with a proper diet and exercise regimen to maximize results. KEEP OUT OF REACH OF CHILDREN. Must be 18 years of age or older to purchase and/or use this product. 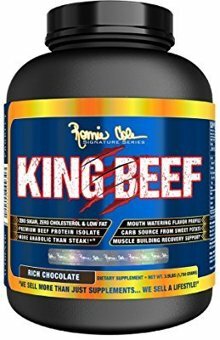 Before taking KING BEEF® or any dietary supplement seek advice from your physician if you are unaware of your current health condition, have any pre-existing medical condition(s), taking any medication(s), planning any medical procedure, pregnant, nursing or contemplating pregnancy. This product contains chemicals known to the State of California to cause cancer and/or birth defects or other reproductive harm. Reduce or discontinue use if you have any adverse reactions such as but not limited to gastrointestinal irritation. Keep out of reach of children and pets. Steak & Potatoes Blend (Hydrolyzed Beef Protein Isolate &, Sweet Potato Powder), Strenght & Recovery Blend (BCAA's [L-Leucine, L-Isoleucine, L-Valine], & Creatine Monohydrate), Hydrolyzed Gelatin, Nitrogen Retention Blend (L-Glutamine AKG, L-Ornithine AKG, AKG).Maltodextrin, Natural & Artificial Flavors, Citric Acid, MCT Oil, Sucralose, and Acesulfame Potassium.